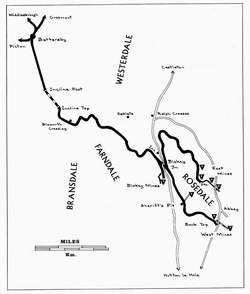 The iron mining and railway community in Rosedale came into being in the 1850s. It flourished for two or three generations, but by 1929 it had come to an end. Some of the miners and railway staff may have stayed in Rosedale, but most of them moved on in search of a livelihood elsewhere. Mine buildings, engine sheds, and other industrial remnants were demolished or fell into ruin. In several places cottages for mining and railway workers and the larger houses of managerial staff were abandoned. The railway line was taken up, but its track now provides a splendid walk of about nine miles around the upper level of the dale. 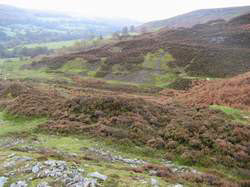 Rosedale lies in the centre of the North York Moors National Park, about nine miles north west of Pickering. 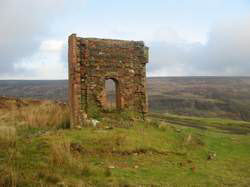 Iron mining began there in 1856, close to Hollins Farm about a mile south of the village of Rosedale Abbey. 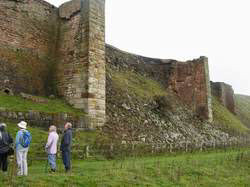 At first ironstone was quarried from the cliff face, but soon tunnels were dug into the hillside. Hollins Mine became renowned for the magnetic properties of its iron ore. I have not been able to establish what chemical components of the ore caused it to be magnetic, but it may have included the oxide Fe3O4 (look it up in Wikipedia). In 1857 mining began on the west side of Rosedale at a place that came to be known as Sheriff’s Pit, at SE 698962. 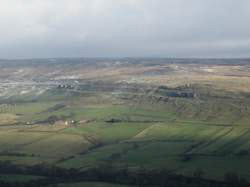 Then around 1859 the East Mines were opened across the dale at SE 706989. More information about all three mines, their ownership, management, and productivity, and major incidents, can be found in R H Hayes and J G Rutter, Rosedale Mines and Railway, Scarborough Archaeological and Historical Society, 1974, and in Simon Chapman, Rosedale and its Ironstone Mines, Peter Tuffs, 2004. For the first few years the ironstone was transported from the mines in horse drawn wagons to the railway line at Pickering. The road surface was poor to start with and it soon became a lot worse. It was clear that a railway was needed, and plans were developed by the North Yorkshire and Cleveland Railway to build a line that would connect Rosedale with the iron smelting works opening on the banks of the River Tees. The line, by then owned by the North Eastern Railway, was opened in March 1861. It began at Bank Top, not far from Hollins Mine, ran north for about five miles along the west side of Rosedale, and then across the moors to a point above Ingleby Greenhow. The Ingleby Incline, almost a mile long and at its higher stretch at a gradient of 1 in 5, was built to carry the ironstone down the west side of the Cleveland Hills. At the foot of the incline another railway transported the ore north to Battersby Junction. Ingleby Incline consisted of two tracks, one to carry three full wagons down the slope, the other for three empty wagons that were hauled up to the top by steel ropes using the energy from the descending wagons. At first the railway served Sheriff’s Pit and Hollins Mine. At Sheriff’s Pit the mining tunnels were connected to a vertical shaft so that the ironstone could be hauled up to the railway line. At Hollins Mine a tramway incline was built to raise the stone 400 feet from the mine to the railway terminus at Bank Top. 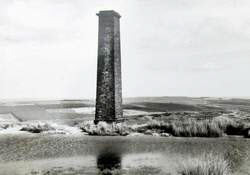 A chimney at Bank Top, linked with the engine that provided power to the tramway, was a prominent landmark on the moor. It remained standing after the closure of the mine and railway, but was taken down in 1972. In the next few years a branch of the railway was constructed to the East Mines. The branch joined the original line at Blakey Junction, and in order to maintain a steady gradient it had to pass around the head of the dale, a distance of 4¾ miles. It was opened in August 1865. Ore from Hollins Mine and the East Mines was put through a calcining process before being taken away. The process removed water and impurities such as carbonic acid gas. The ore emerged much lighter, and could therefore be transported more cheaply. At both places the calcining kilns can still be seen today. The ruins of a building that held a water tank. The track of the railway line can be seen running past the building and in the distance on the east side of Rosedale.